I saw Jamie Riidler's post on Roots of She asking about how your relationship with your body has changed over time and I wanted to respond because I've noticed (and the hubster has noticed too) that since becoming pregnant, I've been more comfortable with my body than ever. I feel strong and powerful. I'm growing and it's a good thing. I'm taking care of myself with regular exercise, and eating well (while still eating chocolate.) I'm wearing clothes that make me feel good. I rub my body with yummy smelling lotions every night. I'm treating myself like the precious being I am. I have to say that I didn't just start treating myself well because I'm pregnant (although that helped a lot.) I had some good practice in taking good care of myself in the months prior to getting pregnant, when I was deep in grief. Last spring I got pregnant for the first time and had an early miscarriage. I don't know that I've ever felt so heartbroken. In the days I was going through it, the hubster (who was amazing) said to me, "Please take all the time you need to grieve. Feel sad when you feel sad, don't hold it back." And I really needed to hear that because I can be the type to try to brush things off and/or stuff things down. But this time, with the help of the permission I felt, I grieved and felt sad when I was sad. I also greatly simplified my life and felt intuitively that what I needed to do was to focus on self-care. One of the things I did for myself was to get up early (because of the summer heat) 4-5 days a week and run. I'd been jogging off and on previously, nothing consistent, but during the summer, it became like medicine to me. Now this may not sound like self-care to some folks, but for me, it was. It helped to be out in nature, moving, breathing, and putting one foot in front of the other. So simple. I could manage this putting one foot in front of the other. I'd come home red-faced and sweaty, feeling strong and connected to my body. I didn't do much that summer, but I did what I needed to do. By the time I became pregnant again, I felt more connected to my body than I ever had and so ready to embark on this new adventure I'm on now. 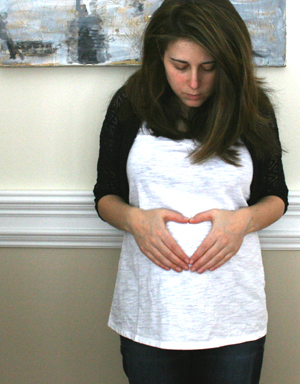 I've also learned a few things from being pregnant that I want to carry with me. *Your body is an amazing creation. Treat it as such. *Regular movement helps you feel more connected and your body will thank you for it. *Buy and wear clothes that make you feel good. Yes, sometimes cheap stuff will do the trick, but don't be afraid to buy quality pieces. *Know that you're beautiful. If you feel that way, it radiates off you and others will feel it too. Now I just have to remember these things postpartum. I'm going to take inspiration from beauties, like this woman, as I do so. Head over to Roots of She to share your own story about how your relationship with your body has changed over time. p.s. I took this self-portrait yesterday at 25 weeks. When we moved into our home in September and I saw the beautiful room that would become my studio, I saw that there was a little spot against one wall that I thought would be perfect for a bench with a cushion. And yet, I waited and waited. I was hesitating about spending money on myself. Did I really need a window seat? Weren't there more important things to spend my money on? And yet, I kept thinking about it and wanting this little nook for myself. With a little encouragement from friends, I moved beyond my initial discomfort and used the money I'd saved up for this purpose to buy a sweet white bench. It came yesterday and I spent part of the afternoon putting it together. And oh, I love it! I imagine this will be a special spot for me to daydream, sketch, read, snuggle cats, and dream up new ideas. And I have more plans for this spot too. It's already got a few small decorations on the windowsill...my cat clock, bird candle, and little spring painting. But perhaps you spotted the paint swatches up on the wall? Yes, I'll be painting that wall in a beautiful blue, hanging some things from the ceiling, and putting up some art. And I'm so excited about it! Sometimes, even when it seems frivolous at first glance, treating ourselves to something that delights our creativity is so worth it. Do you have a little corner, a nook where you can go and dream? Could you add something to it that brings you delight and makes it a place you'll want to hang out in more often? Perhaps you could bring this month's theme into developing your space by imagining what elements you could bring in to delight your senses? What scents could you bring in? What colors? What textures? What sounds? 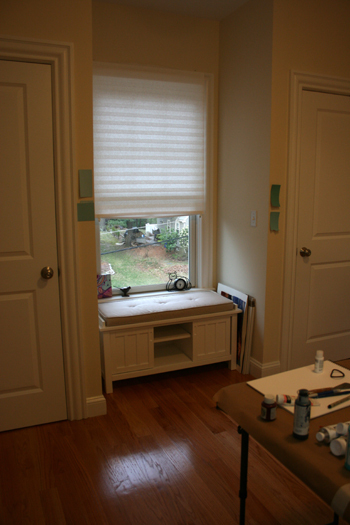 In a room I rented ages ago, my favorite part of it was the built in window seat. Over the two years I lived there, I decorated it with curtains, a hanging plant, cushy pillows, wind chimes, and twinkling lights. It was awesome and I loved escaping to this dreamy hideaway. In another apartment I lived in, my nook consisted of a small table covered with items I loved, such as photos, bowls of shells, candles, etc...sort of like a little altar. When I was a kid, I loved making blanket forts under the kitchen table and pulling in books, the telephone, and snacks. I suppose I'm cat-like in my desire for cozy spots to curl up in! But I know from speaking with others that I'm far from alone. I think these little safe spaces we create are a beautiful way to express ourselves creatively and also to honor our creative selves. It's a way of remembering that we need space not just for the doing, but also for the resting and dreaming and imagining and re-connecting. If you could create your perfect nook, what would it look like? How can you create something like it in your life now? 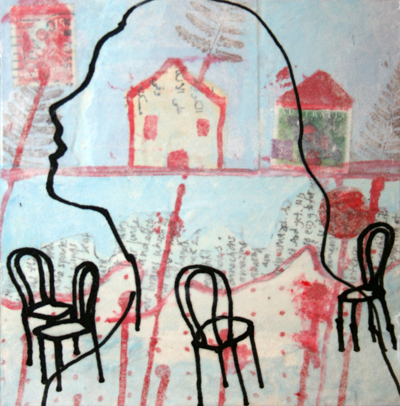 Chairs in a Row, mixed-media on panel, available here. As we move swiftly towards the end of the month of home at the Creative Every Day Challenge, I notice that I've been thinking about and working on feeling at home with myself quite a bit. Part of my working on this has involved regular movement. I mentioned last month that in the past, I was super strict and harsh with myself around exercise and food. I realized recently that my movement practice has very little to do with how I look and is now all about how I feel. What a difference that makes! I started out the winter with a practice of at least 20 minutes of movement 3 days a week. As the winter went on, I realized that to keep my mood up, I really needed more than that, so I stepped it up to 4 or 5 days a week. Much better. And I've found as I stay more in touch with what helps me feel good, I feel so much more in touch with my body and my whole self. I feel like a work in progress (I suppose we are always a work in progress), but I like the connection I've been developing and this returning to myself. Making art is another way I connect with those deeper parts of myself that are not always right on the surface of things. Creating art intuitively, helps me to get in touch with the ideas and feelings that may not have words yet. Along those lines, I'm excited to be teaching a workshop about creating art from the heart in Mindy's Wish*full virtual art retreat this spring! How do you move towards feeling at home with yourself? What are the things you do that lead to feeling this way? How can you bring more of those things into your life? * Creating art intuitively, just letting it flow out. * Returning to the present moment. * Getting support from friends and loved ones. I'm curious about how you come home to yourself, so feel free to share in the comments! I'm going to be out of town next week, but the check-in post will be there on Monday as usual and I've lined up some fabulous guest posts to keep you thinking about March's theme of Stories! Wishing you all a fabulously creative week! Normally I'll interview just one, maybe two folks per month, but I hope you've enjoyed my chats with creative folks on the topic of body this month! It's so funny, usually I'm this ultra introverted girl who gets nervous on the phone, but this topic of body has had me wanting to talk to loads of people for the blog! There were many more people I thought about talking to as well, but there's only so much time in the day. Certainly a different kind of creativity than I usually partake in, but it's been so fun! One thing that's been coming up in my conversations with these fabulous, creative women has been the concept of listening to your body. I think this is a big key to developing a healthy, happy relationship with body and yourself. 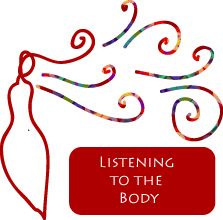 How do you tune in to your body and hear what it has to say? And when you do hear it, do you listen? This is something that can be a challenge for me. At times my body is easy to hear. And sometimes I'm not a good listener. But I think so much of life is about practicing, not beating yourself up when things don't go the way we plan, and continuing to grow. *Movement: Yoga, dance, long walks, and such are one of my favorite ways to connect with my body. Noticing where and how my body wants to move as I move, is a great way to connect and tune in to my individual body parts and my body as a whole. Plus, when I take good care of my body by moving it regularly, it's more likely to share information with me. *Fabulous body-centered self-care: Getting a massage or taking a long soak in a tub is a wonderful way to connect to my body. Sometimes when I take a bath, I bring books or magazines to read, but I rarely touch them. Once I'm in the water, I just let go and feel so peaceful. *Deep breath: One of the simplest ways to connect to your body is to breathe. We do it all day without thinking about it, but if we stop and notice one breath in and one breath out, something relaxes. *Body Scan: When I was little, my mom taught me a simple way of relaxing, a visualization where, starting with your toes and going up to your head, you notice each part of your body, notice it relaxing, notice it tingling. And then you imagine yourself in a peaceful place, hearing, smelling, and feeling the space around you. There are all sorts of visualizations I've learned in the meantime, much like this one, and they're all a great way to let go of the inner chatter and get re-connected. What about you? What are your favorite ways of tuning in to your body? p.s. The little figure above is something I did up in a program called Illustrator. A lot of my creative output lately has been on some behind the scenes projects, including a project in Illustrator, so I was inspired to create this quick drawing with it. But more on that later! This piece is coming along verrrry slowly, but it's been an interesting process using body shadows as the starting point for a piece of art. One thing I'm loving is the little heart that showed up in the bird's body. 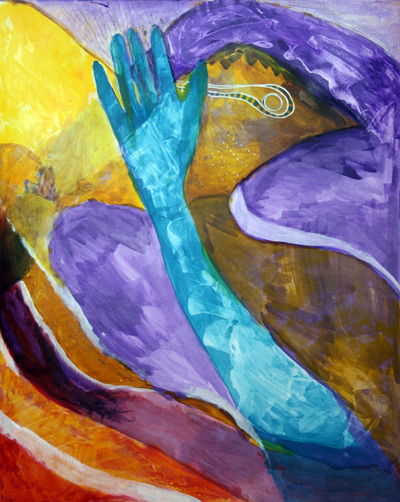 And within the piece, in the soaring bird, the blue hand and the layers below, I think there's a message from my body. What is this message exactly? I'm not sure yet, but I feel like it has something to do with gentleness. I have an inner drill sergeant that barks orders in my ears about everything from my body to my artwork. Thankfully, it's so much quieter than it used to be. In my early 20's, I became obsessed with my body. Like many in their first years in college, with the larger than normal consumption of pizza and mac & cheese, I gained a few pounds. And along with the pressures of being in school and trying to figure out what my future held, I became unhealthily obsessed with exercise and food and fat. Oh, it was not a fun time. I worked out 6 days a week, weighed my food, was crazy restrictive, and very cranky. I dreamed about the foods I longed to eat, but I did not eat them.. After a couple years of this madness, I was thin, yes, (people thought I was ill), but I was also miserable. And worse, I still felt "fat." It's so easy to get sucked into the image of what women look like in the movies and television and think you're supposed to look like that. So much misery stems from trying to be some unattainable image. And then if you add in a strict drill sergeant voice, ouch. Eventually, an inner rebellion began to build and warred against my inner sergeant and won. It was bound to happen eventually, but eating endless forbidden foods was not making me happy either. I had to find a balance again, I had to re-learn how to listen to my body, what it needed, and trust that it knew what was best. And that was hard. Over time, I've developed a relationship that is infinitely kinder and works a million times better for me. What does gentle look like? For me, it's about adding movement to my day because it makes me feel good (instead of out of fear of what will happen if I don't) and about allowing myself to eat what I want, while also noticing when I'm full and stopping. It's about adding self-care and noticing what my body is craving. Have I banished that inner drill sergeant and healed my relationship with my body completely? No. It's a path I'm on. It's a path so many people are on. Sometimes, I still struggle with feeling like if I'm not beating myself up or guilting myself into action, I won't do anything at all. Just last spring, I signed up for a bootcamp exercise class. (What was I thinking?) And after the trial class, I quit. I remembered that route doesn't work for me. For me, the drill sergeant approach always leads to an eventual rebellion and that's a cycle I don't want to be caught up in anymore. And what does this all have to do with creativity? Well, you know that drill sergeant? She doesn't just have things to say about our bodies. She also has input about the rest of our lives, including our art. With art, she might say things like, "That's not good enough! Why haven't you done more? You're lazy! Get to work and make good art, on the double!" Ouchie! What's your art sergeant yelling in your ear? As I've learned to be more gentle with my approach to my body, I have also learned to be gentler with my approach to my art and creativity. And in both cases, I've found the gentle approach to be far more loving and sustainable. Part of the gentle outlook is what led me to start Creative Every Day. I loved the challenge of creating and posting daily for Art Every Day Month in November, but it wasn't something I could keep up for every day of the year. So I found a way to make creativity a part of my everyday life and it's been such a joyful (guilt-free) process! Regular risk-taking and bravery are great for stretching yourself and growth. There's room for that kind of leaping too! But for day-to-day life, having space to be gentle, permission to do things smaller, and making things doable, works beautifully for me. I think it's so much easier to build upon our successes. It makes for a lasting relationship, one I can maintain without falling into a strict regimen or a rebellious outburst. So how can you take a more gentle approach to your art, your body and life in general? Check in with yourself, notice what you your spirit is craving. Take your to-do list down a notch and simplify what you plan to do. Make it doable. Celebrate your accomplishments. Make an already done list! List the things you're grateful for. Notice what delights you and add more of those experiences to your life. Play with being gentle as an experiment, see what happens. The list goes on. What would you add to it? Stay tuned for more discussion about the body. 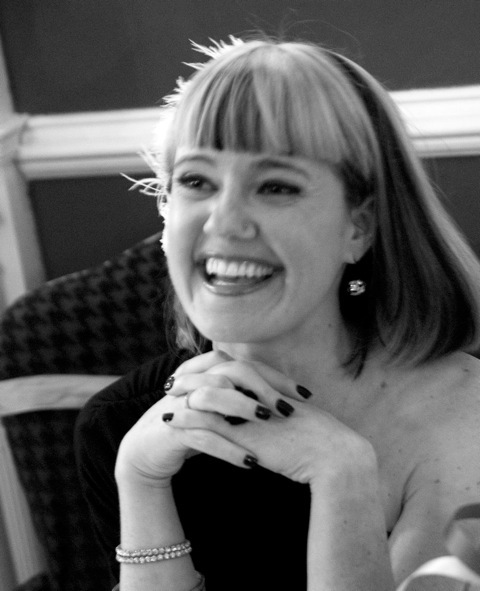 In a couple days, I'll have an interview posted with the super smart Blisscovery expert, Briana Aldrich! This one kind of floated out of me today. Ha! I suppose that makes sense with the image too! 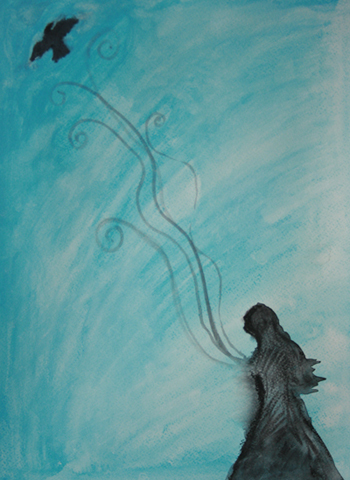 I had started drawing the figure with water-soluble wax pastels and there seemed to be this release coming from the heart, which I drew out into swirls. Later, I came back to it and had the inspiration to add the bird. I think it has to do with releasing negative energy. Having been through a difficult situation recently, I was still feeling some lingering ickiness around it, and this image feels healing to me. I love how things can just flow out when we give them the space to do so!